A little while ago a friend of mine by the name of John Munroe sent me this great little Olivetti 32 ‘Katakana’ typewriter. I’d been keeping an eye out for such a machine for a number of years now, but as you may expect – such typewriters are generally non existent in markets that are available to Australia. I spoke to John a little while back after he found a Royal that was set up for Japanese somewhere online, and I asked him to keep an eye out for one for my foreign language collection. John lives in Tokyo, and was confident that he’d come across another one pretty quickly. And quickly he did. 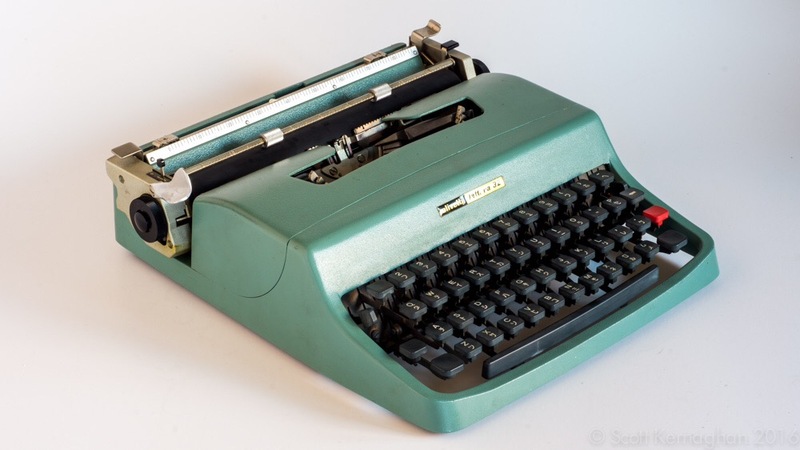 It wasn’t long before he managed to get his hands on this magnificent Olivetti Lettera 32. Of all the L32’s I have had, after this guy was cleaned up I found that types nicer than any other machine I have ever owned of this model. So John Munroe. I owe you heaps, and much more than a huge, huge thank you! I’m very grateful to John for sending me this machine. Back when I was at high school, we were required to study two languages. Japanese and German. I was far better at German than Japanese, but I have long had a fascination with Japanese culture. My sister also lived there for 10 years and is fluent in Japanese. Katakana is only one piece of Japanese written language, and is often used to articulate English words into Japanese. The history of the Katakana keyboard dates right back to the late 1800’s. But it really came into existence in the 1920’s when some members of society in Japan were pushing for a simplified or reduced version of the Japanese language. The idea was to use that Katakana syllabary in a gestalt structure that is closer to the structure of European languages. While earlier keyboards were designed with a full set of Katakana glyphs (Kana), later they used dead keys on keyboards to allow the completion of characters. This Olivetti has a couple of dead keys. Note the placement of the ‘P’ key? Right next to that… On the left, is the first dead key to be found on the keyboard. If found this positioning especially peculiar. What about the English characters on this typewriter? Ahhhh yes… Well… That decreases the Kana (Katakana means Fragmented Kana) characters used one this keyboard.. Right? The thing about katakana is, that it is also used in circumstances where English words are crammed into Japanese language – in the way that in English we italicise foreign language words. So what does this typewriter do? John’s suggestions that it is a typewriter that would be in use by telegraph operators to move between Japanese and English is a pretty sound one. Katakana can be used as a simplified Japanese language. 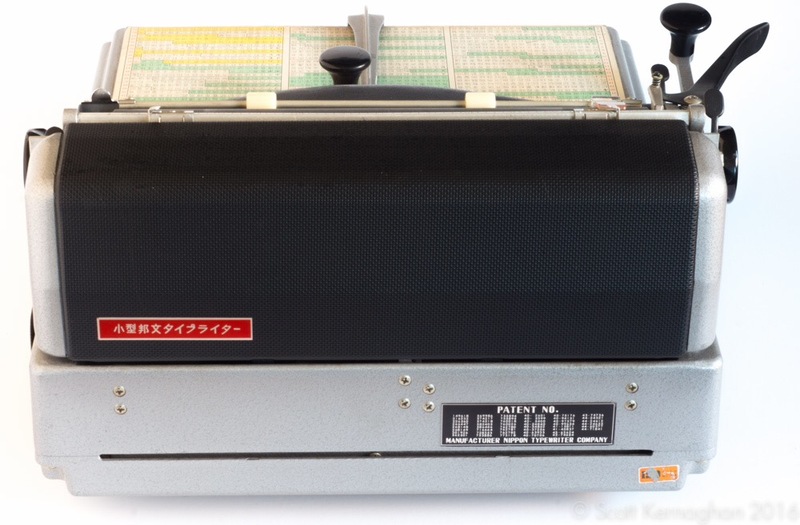 But it could also be used in a studio to produce Katakana segments for English words on this machine – when the writer was using a different keyboard featuring other kana – Say… Hiragana. But I don’t think so. The push in Japanese society was based around making language more universal. Contentiously, several key developments occurred when there was a push in Japanese society towards using English langauge more universally. Although the by the late 40’s – post World Ward 2, there was also a push towards using French. Either way, in the 20’s the first Typewriters were being produced based to write a in romanized gestalt structure in Katakana. 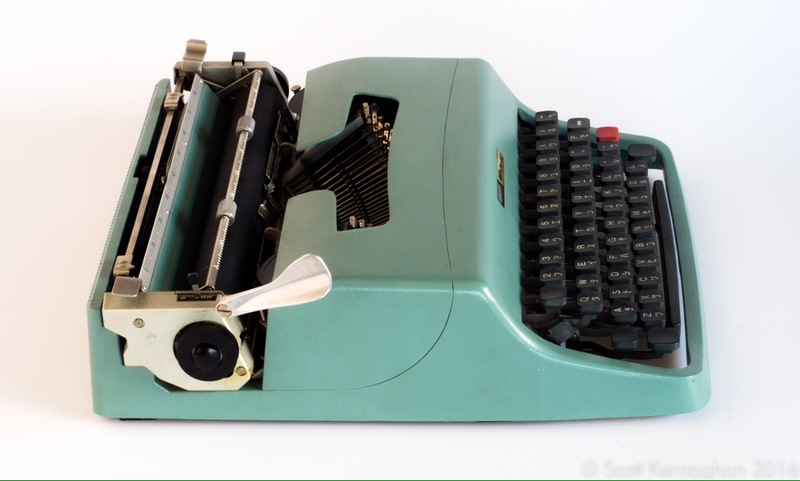 Just for reference, the company that produced these first machines was Underwood – who Olivetti eventually bought and absorbed into their organization. No… Let’s. Let’s talk about Kanji. Written Japanese language can be something of a horror to people that grew up outside of Japan. Even inside of it, there’s plenty of things that can – and do – often go wrong. It’s not that romanised languages are perfect – but the diverse structure in Japanese (a problem also shared with Chinese languages) often causes complexities. The positive thing about Kanji is that it allows for quite an efficient expression with more nuance. So… Like every other language in existence, there’s plenty of people that take a much more puritanical view to their language and many in Japan resisted change. The problem was that there wasn’t much of a way to easily produce written documents on a machine. Considering that the Japanese language has thousands of characters – it obviously wasn’t going to be easily presented on the keyboard unless the keyboard was huge. Enter item number 2 that is new to my collection. Welcome to the Nippon Type. Over a century ago the Japanese started producing heavy and lumbering machines that had thousand of typeface characters that operated wtih a feed mechanism which pulled characters out of a grill. It involved moving the carriage over the top of the grill and positioning it above the character and then feeding it upwards to a type hammer that pushed it against the page and the ribbon. It then drops the hammer back, and the character falls back into the grill. This mechanism improved dramatically in later years, and instead of a moving carriage, the grill floated on a rack which moved under the carriage. Eventually a character board was put in front of the carriage, allowing the user to type by moving the arm that was connected to the grill, that has a stylus on the end that the user points at a desired character with. The characters are grouped into syllabary or kana, and kept together in an order that is predictable. As you can see in the photo below such groups are colored to make it easier for the typist. On the left of the machine is a solid arm that has a black knob that operates the character pulling mechanism. The small black lever next to that is the space bar. This allows the typist to quickly use operate with their left hand, while swinging the arm with the stylus with their right – selecting characters and quickly tapping it in. The carriage has a large black lever that operates like every other carriage lever. Interestingly, the machine is set up to type right to left with the characters positioned to be read along the page, rather than down it as was traditional. Maybe the Katakana brigade made some in-roads there. 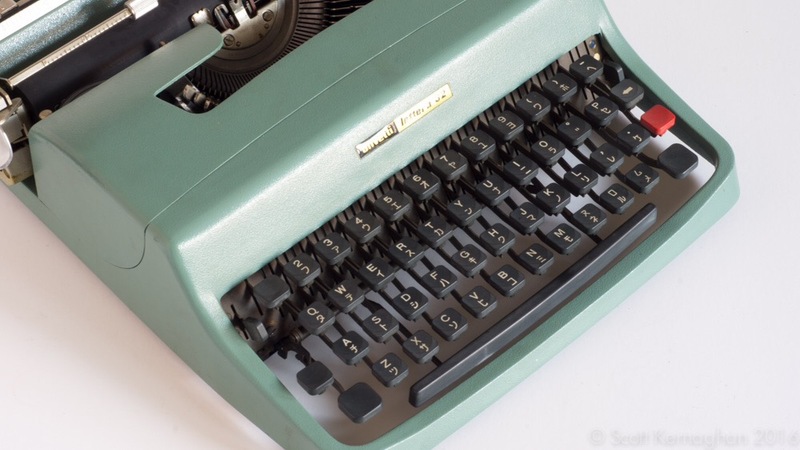 Interestingly, the typewriter also has a group of Roman characters grouped on the machine, allowing the user to type in English – or at use least English word. These are also regarded as Kana – and known as Romaji. 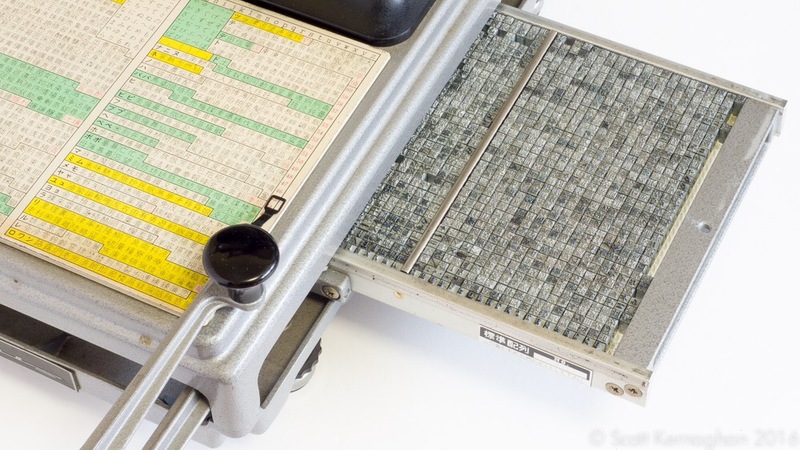 The characters are kept in a smooth moving tray that feels like it is floating under the machine. When the mechanism operatingarm is pulled down on the machine you can feel the tray Bing pulled into alignment to the closest character. Then the mechanism starts and the hammer makes a solid thump as it punches a character piece against the platen. It’s a surprisingly noisy operation. But quick. To reduce the noise around the typewriter the rear of the machine has a noise deadening bulkhead that is supposed to absorb some of the noise. But it isn’t anywhere near as fast as typing on a keyboard. The efficiencies that most typewriters produce for writers are all but wiped out by the movement which is more energy consuming than writing Kana by hand by hand. 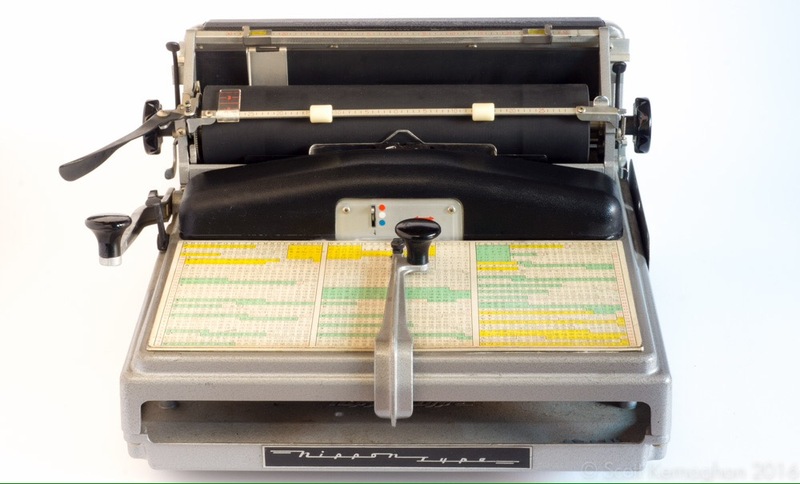 The interesting thing about this machine is that – unlike the lumbering and heavy old Japanese typewriters of the early years, this beast is surprisingly light – weighing less than an Olympia SM4 in its case. Sadly though, some of the type elements are missing, so the machine isn’t complete. Although interestingly enough, type elements can still be ordered. Anyway, this is just a brief look at that crazy world that is Japanese typewriting. I hope you found these machines interesting. I’ll have a closer look at both and maybe their history in another post. ← Type O +VE Podcast episode 1 is now on the wires. Two very interesting machines indeed. You can still order type elements? I am amazed! As was I when I started looking into this typewriter. No idea why though. To be frank I was rather surprised to find one in Melbourne. Mind you, the Mormons mightn’t be able to transport them on their bicycles. 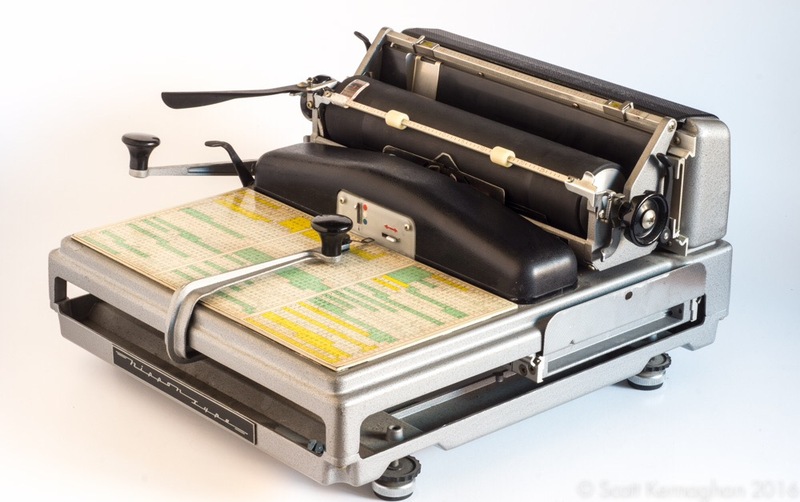 I’m looking for a Katana typewriter as well. I have a couple of friends’ Japanese wives going to put out the “Nihon Feelers” to see what they can come up with. It will definitely help me with my Nihongo studies. I am not good enough for the Nippon Type, yet. Catching up on a bit of reading. This is a really interesting couple of machines here, great finds! 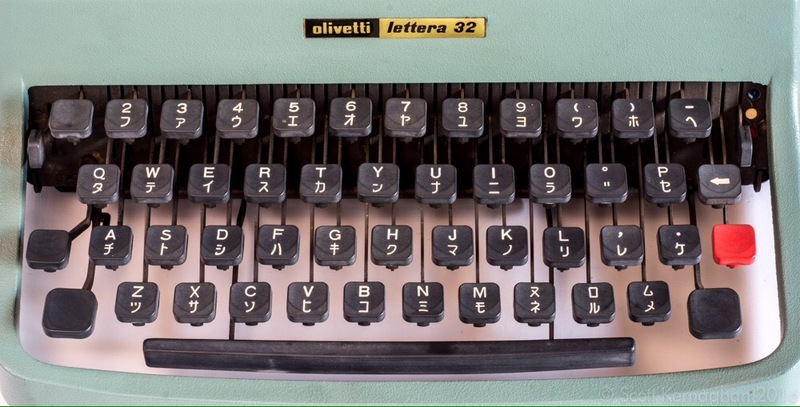 Would love to find this Olivetti with katakana keys and the Hermes with hiragana keys. Any suggestions on where to locate either without having to buy a ticket to Tokyo would be greatly appreciated.